What’s going on with advertising from hosts lately? We’d broken the story about the questionable Media Temple ad that appeared in the Web Host Industry Review. Some wondered whether it was degrading to women and why a mainstream web hosting company would risk their brand with such an ad. That one is still kind of hanging out there unresolved, at least in my mind. Anyway, I scanned the pic so I could think about it and post my thoughts. I kind of forgot about it and the picture of the rather unusual HostGator ad has been sitting on my desktop since January. Today I stumbled upon my friend and fellow web host blogger Dimitar’s blog and saw that he’d posted about the ad. He has a lot to say about the “cubbish” ad, so do check it out. But before you do, take a look at the pic above, ponder and post your thoughts. I’d like to know what the ad communicates to you. I’ll eventually post my thoughts in more detail as well. One thing to note is that I am not showing this image to denigrate HostGator. Goodness knows these hosts get enough pummeling, deserved or not in the comments of our web host reviews here. 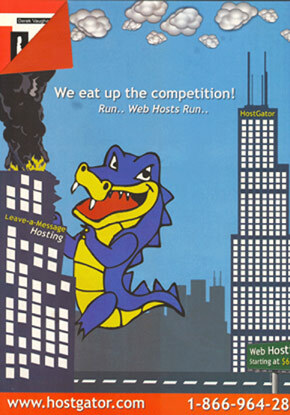 I am not saying anything here about HostGator’s products, but their advertising. HostGator has been one of the few hosts to receive a perfect rating of 5/5 stars in our review of their shared hosting service not too long ago. So tell me, what does this ad say to you? Well, there’s certainly nothing from with the ad from my perspective. I suspect you realize it’s in jest / comparison to a ripe ol’ game called ‘Rampage’. The MT one though was completely tasteless & not even ripe for a trailer park. Thanks for pointing that out David. The first thought that came to mind when I saw the ad was the September 11 attacks. I feel a bit better about it after learning about the game, except, I wonder why no cues for those in the audience who hadn’t been exposed to the game. I haven’t heard of rampage either. I’ll have to see what its all about. I know that I’ve been on a few rampages of my own though. I love it. I think it shows they are saying they have the best support in the industry. They do eat up the competition. Thats why I host my sites with them. Lets give it to them for their creativity. It does look like the game Rampage slightly. Or maybe a slight reference to the supposed The Planet fire awhile back? The stimulus ad is quite cool and will definitely draw some interest out of curiosity. Even here in Australia I’ve noticed a couple of TV ads using the stimulus package (yes, our government is running them too) to advertise their products. Bit of a punt but would be interesting to know how it turns out for them. It’s kind of old to me but maybe they had something else in mind when they decided to go with it. The real problem here to me is that they haven’t conveyed their message to the reader/viewer. I mean, how many others looked at this ad and went: “Ho hum”. If you really want to get a message across, I don’t think ‘killer gators’ perched on an office building is gonna do it. Not in this age of competition anyway. BTW, I still have some old clients that are hosted with them and they still love it! So my previous comment is directed at their ad only. Not their products or service which have been exemplary to date. I like the stimulus ad. Simple yet engaging normally works best and this has all the hallmarks of that. I want to put some Hostgator ads on my site… Hostgator will really pay for it? ?